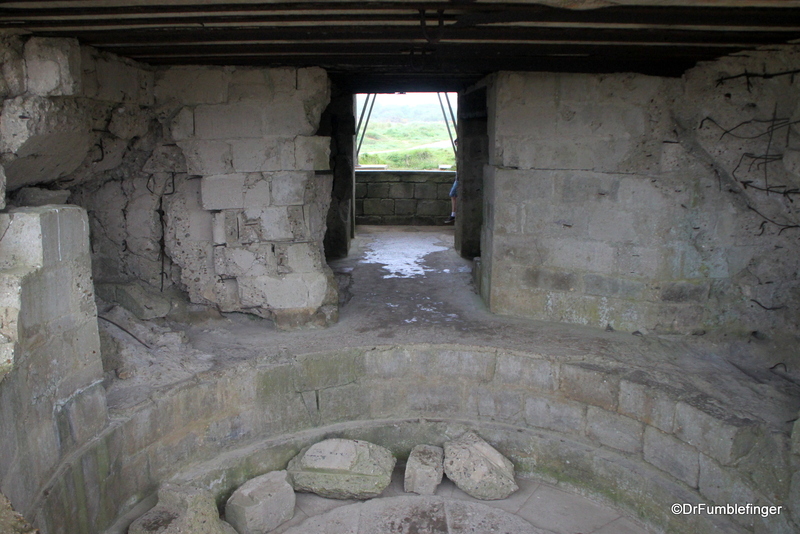 True to its history, our visit to the coast of Normandy was cool, windy and wet — but that’s how it’s been for thousands of years. Many an armada was delayed in leaving or landing on these shores because of inclement weather, including the D-Day attack which had to be postponed one day to June 6, 1944 because of poor weather conditions. 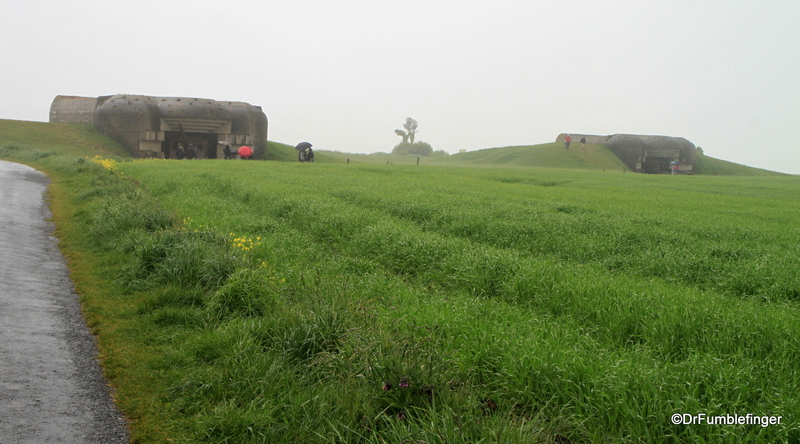 We spent two days exploring the D-Day sites, not an exhaustive visit but enough time to gain a perspective of the region you can’t get from books or films. Our goal was to see the different fronts of the invasion and gain a first-hand understanding of the scale of the largest naval assault in world history. 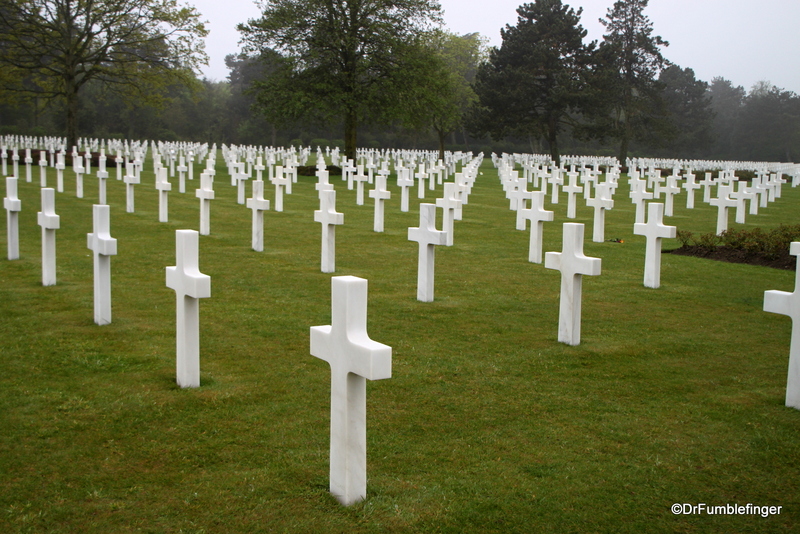 And we came to pay our respects to all those brave young warriors who lost their lives in the Battle for Normandy and who changed the course of human history. 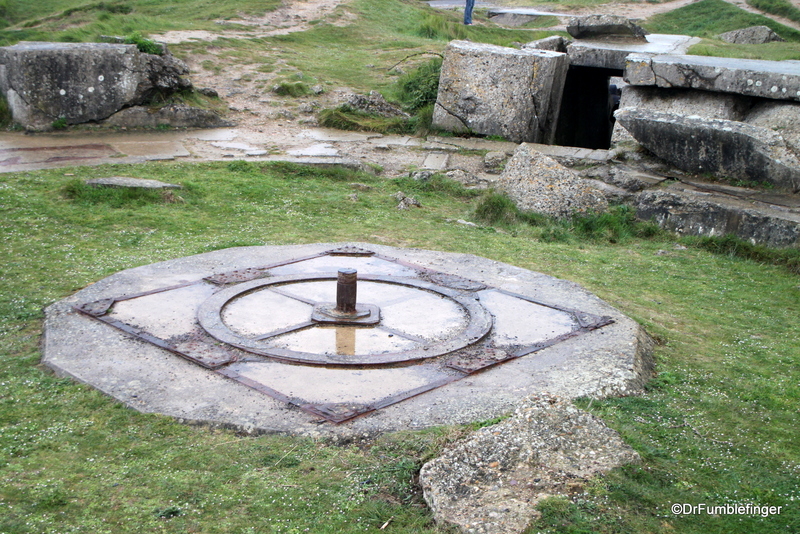 During the D-Day landings, code named “Overlord”, five areas of the Normandy coast were divided for attack between American, British and Canadian troops specially trained for the assault. The beaches were, for reasons of security, given code names, from West to East these being: Utah Beach (USA), Omaha Beach (USA), Gold Beach (UK), Juno Beach (Canada) and Sword Beach (UK). The assault started with airborne divisions dropped by parachutes during the night, followed at 0630 by six divisions landing on the 5 aforementioned beaches. The Battle for Normandy, which lasted three months, gave the Allies a strong foothold on the continent and they advanced toward the ultimate liberation of Europe in 1945, but not before hundreds of thousands of soldiers and civilians were killed. 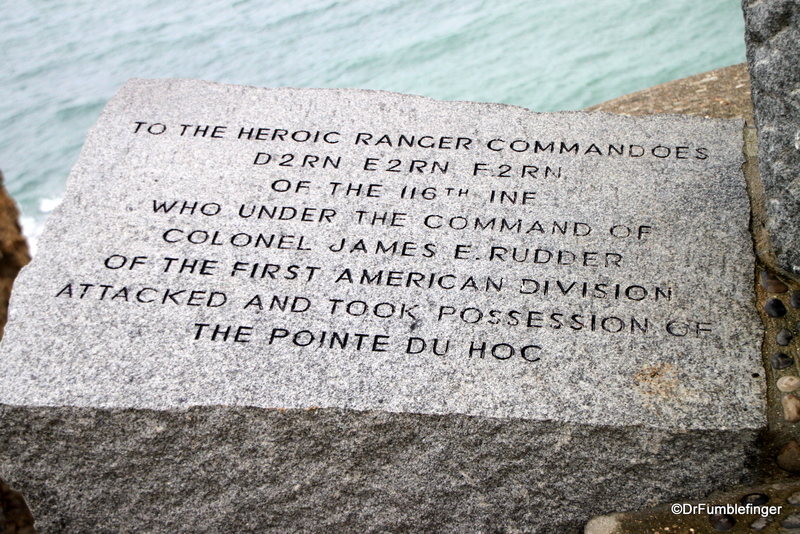 1) Pointe du Hoc and its Ranger Monument. 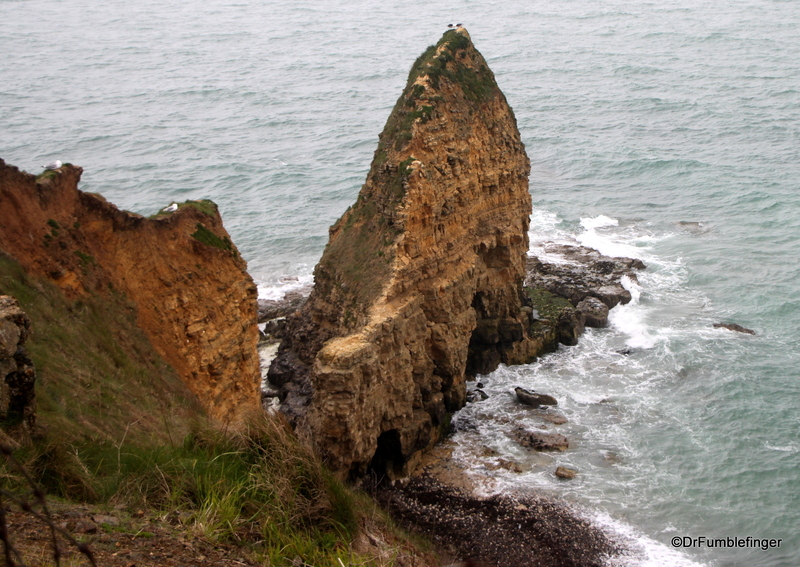 The sheer cliffs of Omaha Beach were scaled by 225 hand-picked Rangers — the best of the best — 60% of whom were killed or seriously injured in their efforts to reach and disarm the German artillery here. 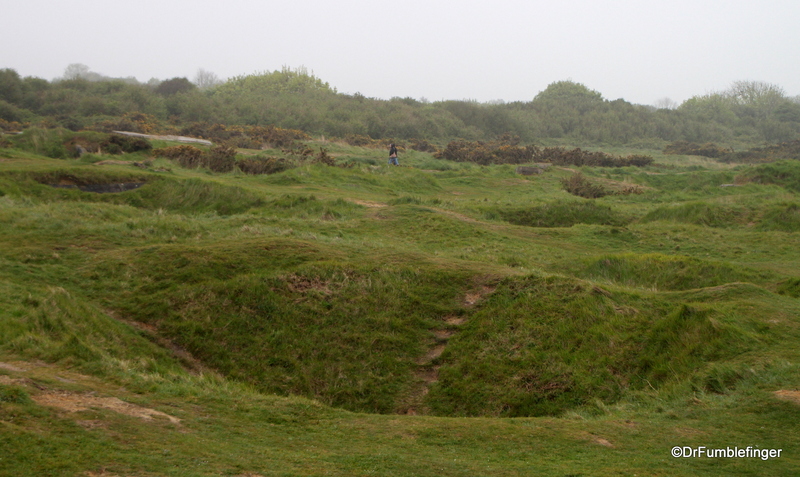 The landscaped is deeply scarred, pocked with dozens of bomb implosion craters from planes “softening the target”. 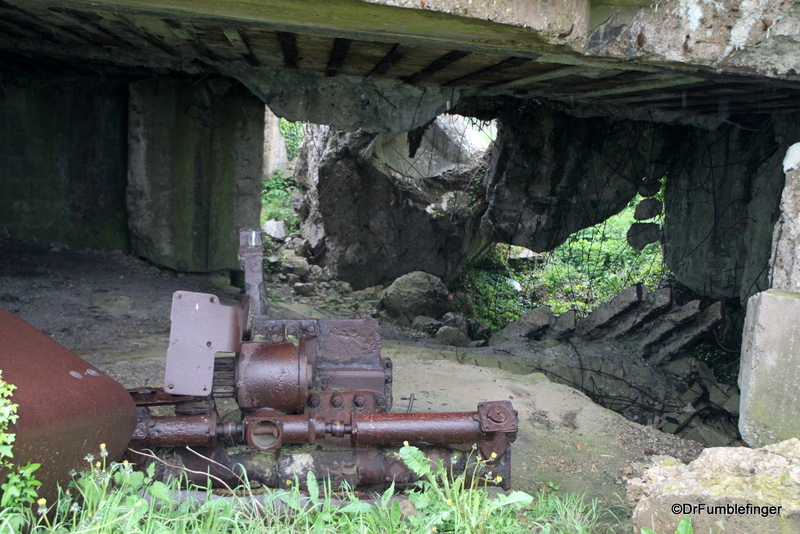 Those Rangers who survived the climb up the cliff found the guns had been removed, but they destroyed these bunkers, moved inland 1 kilometer, found their large guns and destroyed them. Mission accomplished! 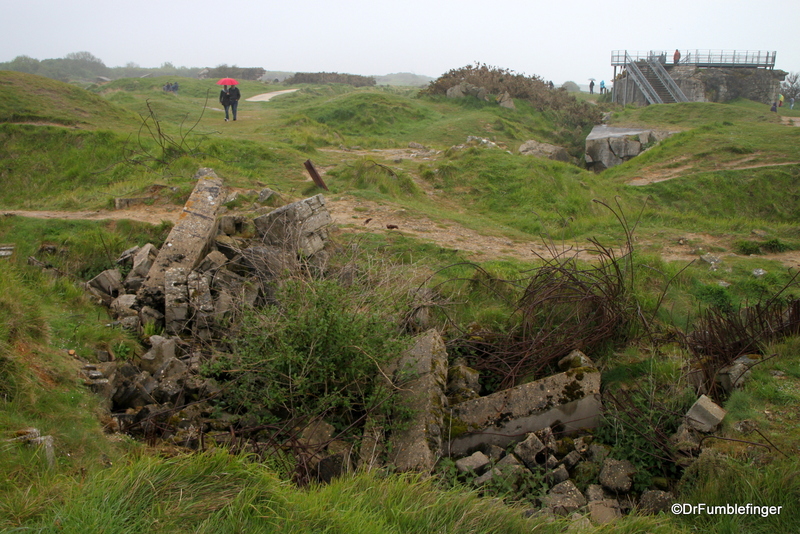 At the far end of Pointe du Hoc, you can see the granite Ranger “Dagger” Memorial set atop a bunker. The Dagger is the symbol of the U.S. Army Rangers and the memorial honors those of the 2nd Ranger Battalion who scaled these cliffs. 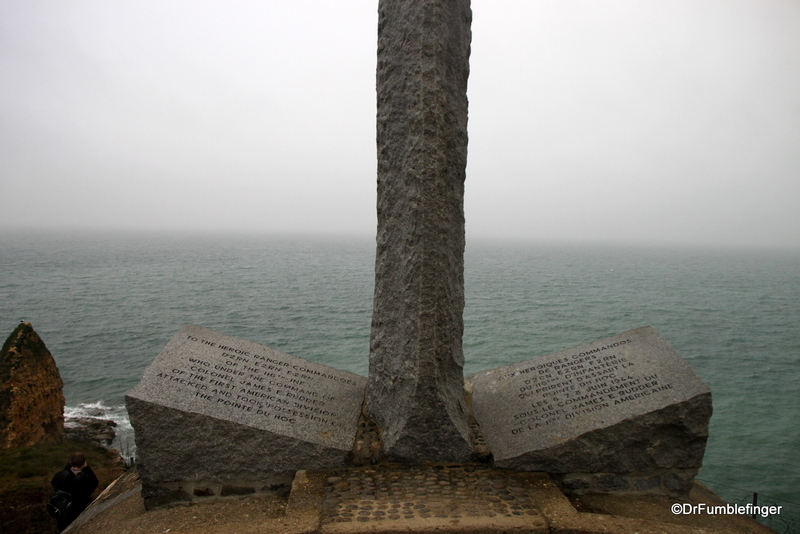 A large plaque near the entrance to Pointe du Hoc has a quote by President Ronald Reagan, who on the 40th anniversary of D-Day gave a memorable speech here that was a wonderful tribute to these brave young guys, “the boys of Pointe du Hoc” as he called them. 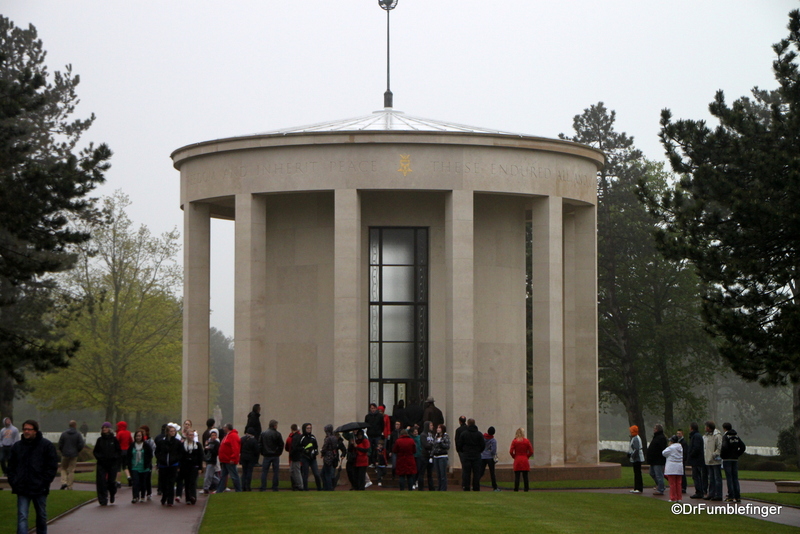 2) World War II Normandy American Cemetery and Memorial. A gift of 172 acres to the American people by the people of France. 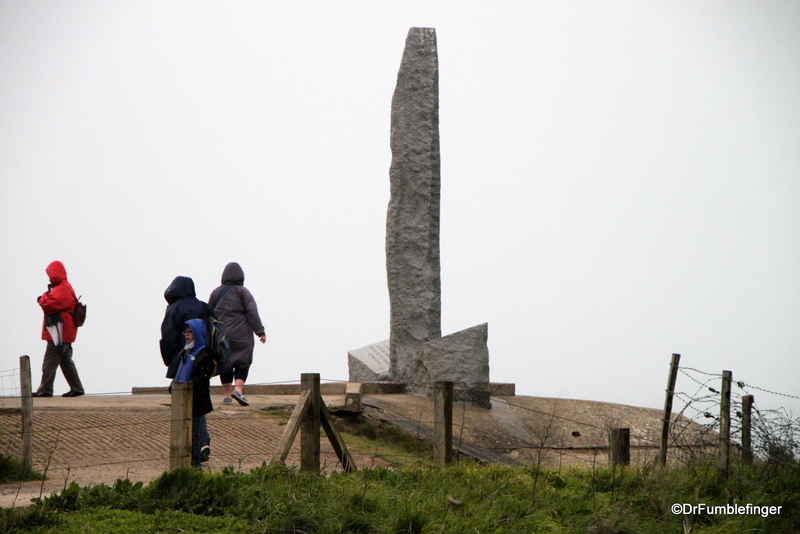 Perhaps the single most moving monument in Normandy is this cemetery, sitting on a cliff above Omaha Beach. 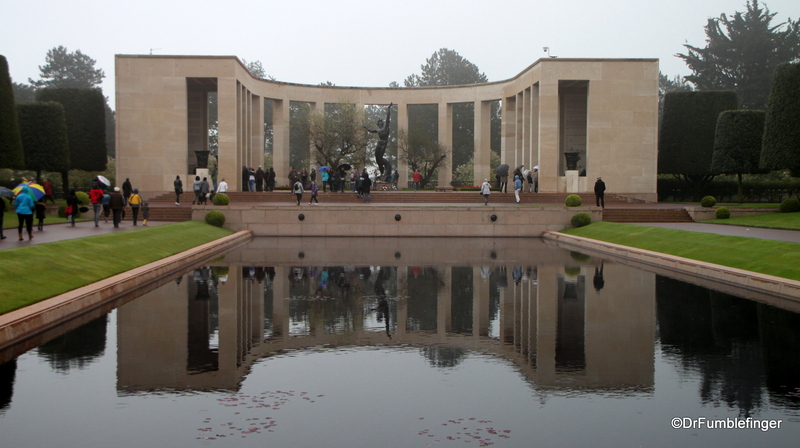 More than 9,000 white marble monuments — crosses and Stars of David — mark the final resting place of some of the Americans who helped free Europe. 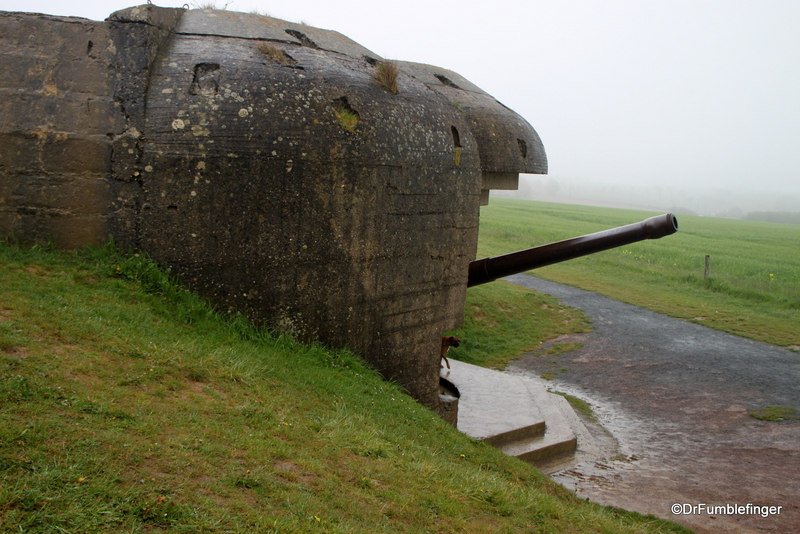 There’s an excellent visitor which is where you begin your visit, descending to a museum that gives an overview of the war, the decisions leading up to D-day invasion and the course of the war beyond that. But more importantly it also sheds light on the human costs of a war. 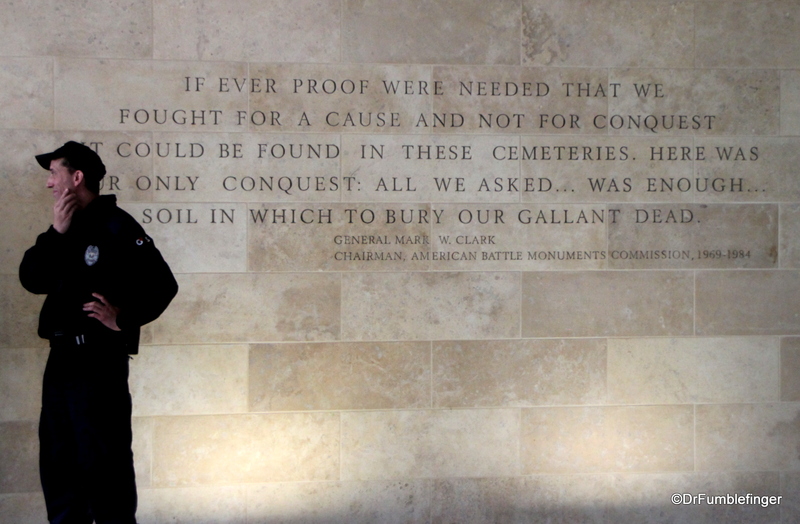 I found particularly moving the stories of individual soldiers who lost their lives and are buried here. Film clips of these soldiers and of their surviving relatives remembering them are gripping in their simplicity yet intensity. One I remember vividly is of a young mid-West USA farm boy who was killed nearby. His family said he would have wanted to be buried here because he came to liberate farmers — the French to him were like the folks he knew back home, simple people who loved and worked the land, like he and his family did. When your visit to the Museum is completed, you exit to the cemetery. It is here you see the beautifully symmetric rows of crosses and the large monuments. One of these monuments is a statue soaring to the sky symbolizing the spirit of American youth. 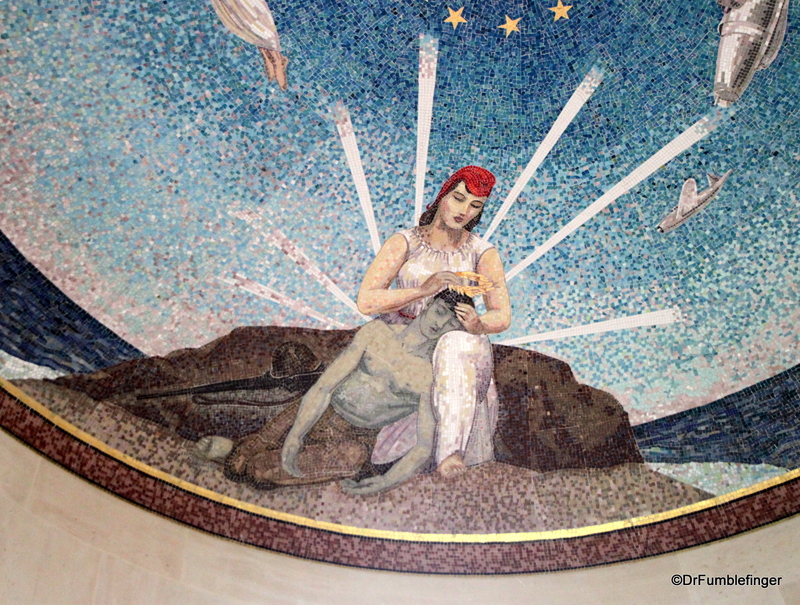 There is also a small chapel in the center of the cemetery with beautiful ceiling mosaics including of America blessing her departing sons and France bestowing a laurel wreath upon the American dead. 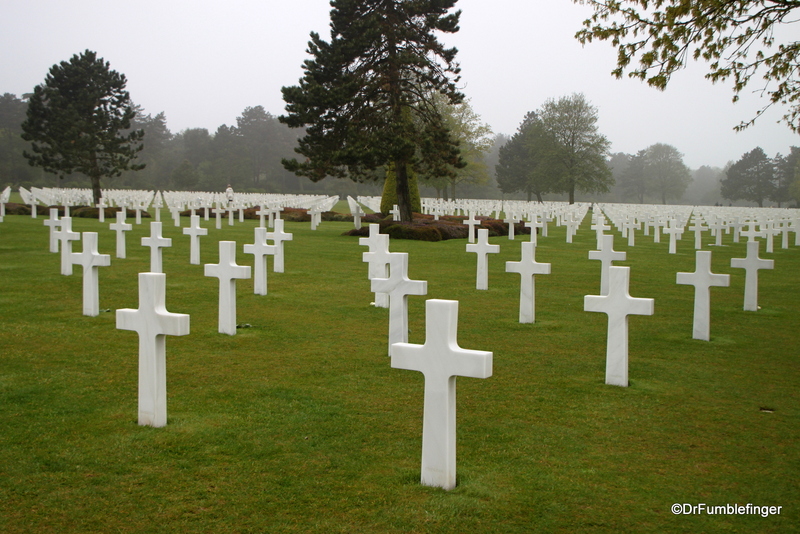 There are several nice viewpoints of Omaha Beach and the English Channel from the Cemetery. Footpaths take you from the cemetery to the beach if you want to walk on its sands. 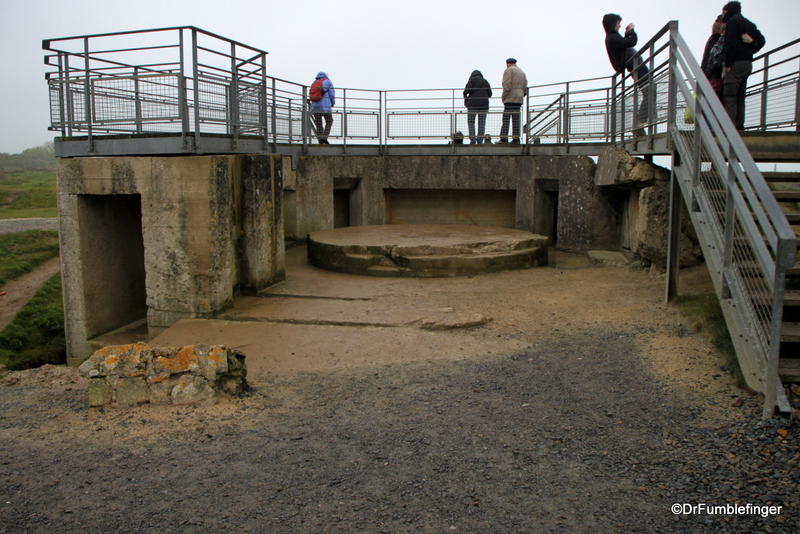 3) Longues-sur-Mer: The only surviving artillery guns in Normandy are found here, with four case-mates (three intact, one destroyed by a bomb) that were built by the Nazis to fight a seaborne attack. 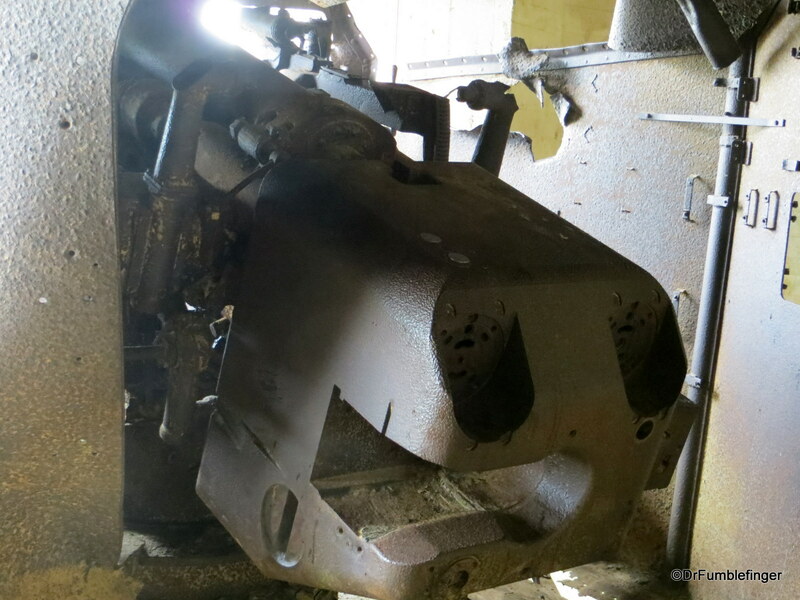 These 150 mm guns were part of Hitler’s Atlantic defense and impressively could hit targets as far as 12 miles (19 km) away. You can walk between these placements and go into the bunkers as well. 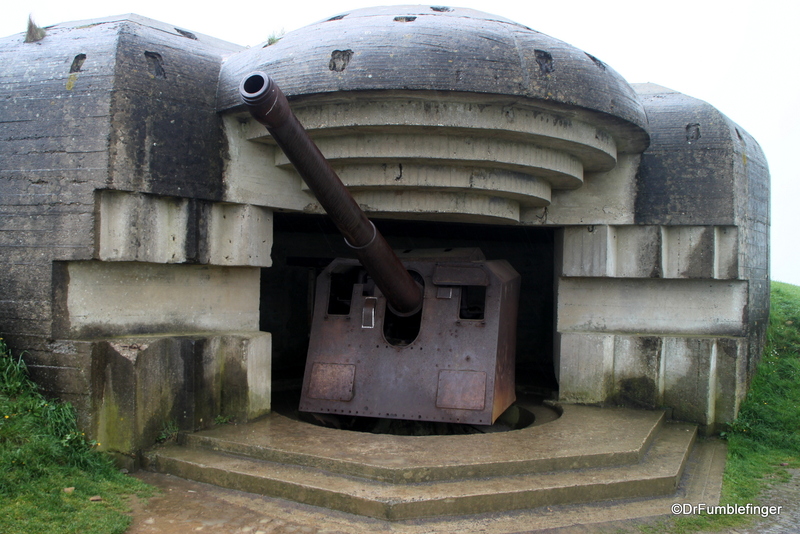 Each bunker was staffed by seven soldiers, who must have been deafened by the roar of these guns. 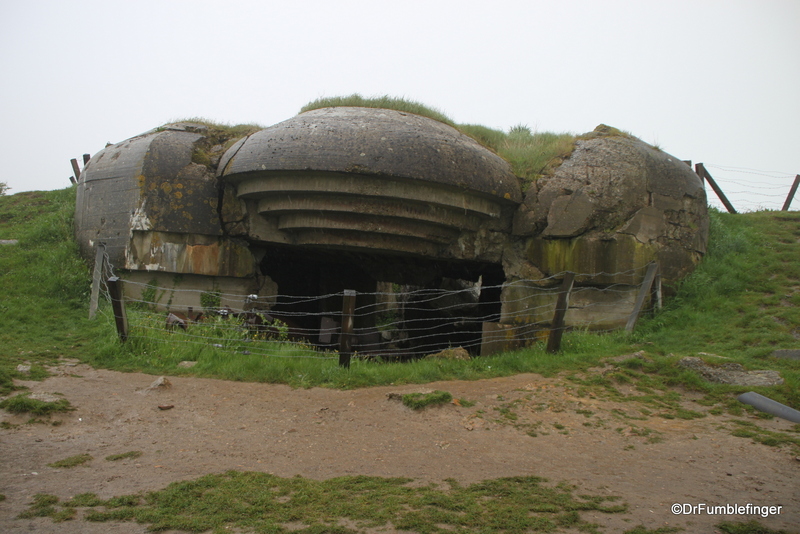 Walk to the cliff overlooking the sea, where you can find and explore the observation bunker where spotters directed the firing of the big guns. 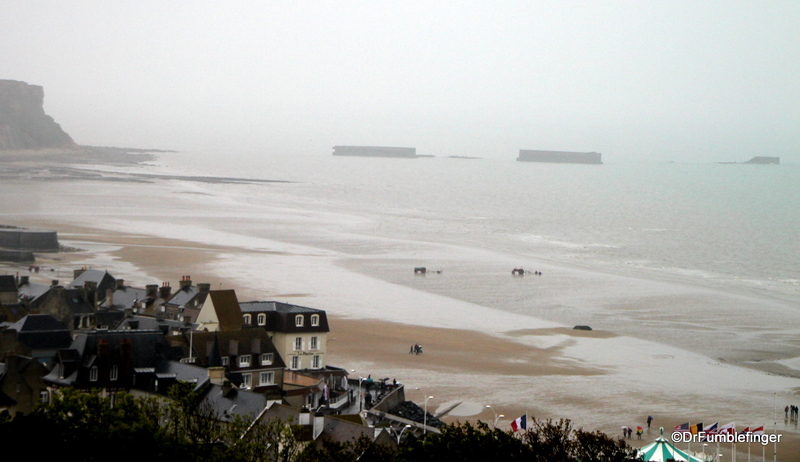 4) Arromanches: An extremely important town for the D-Day invasion, giving the Allies a quick foothold and more importantly, a port. Start your visit here by going to the 360 Degree Theater sitting on a hill overlooking and providing great views of the town and harbor. To the right lies the British and Canadian sector. To the left lie the cliffs of the American sector. 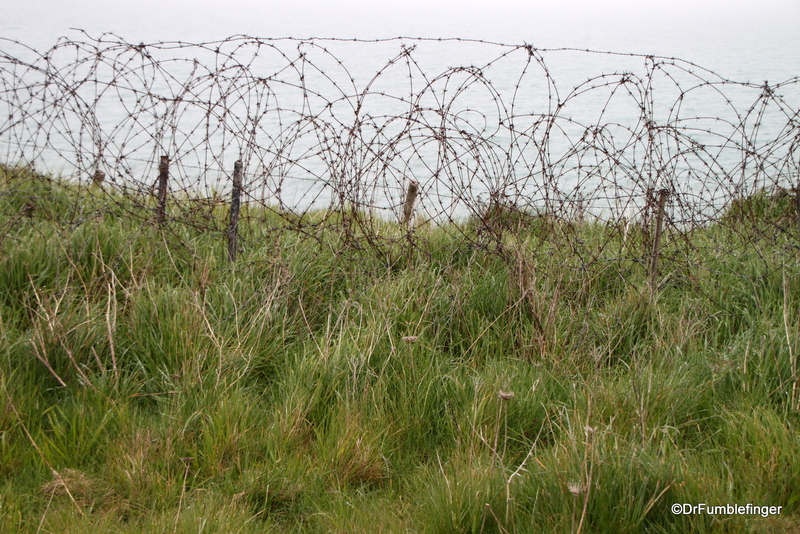 The film showing at the 360 Degree Theater, called “The Price of Freedom”, gives you a broad rounded film presentation of the historic context of the invasion and specifics of what happened at Arromanches, with actual WWII footage. 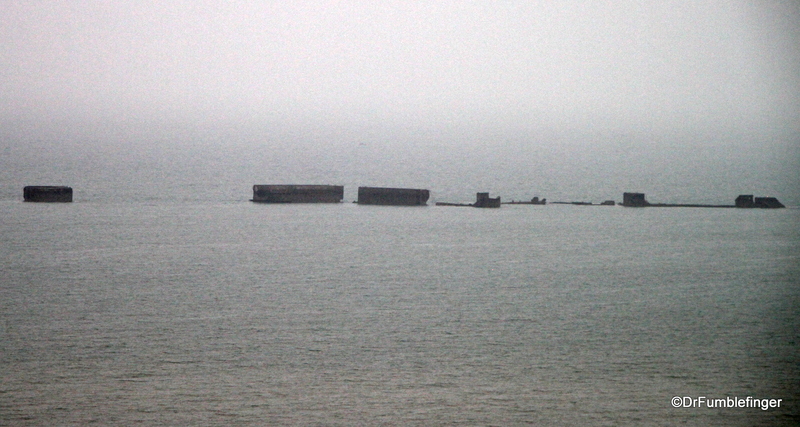 The harbor quickly built in Arromanches was formed by the sinking of 17 old ships and 115 massive cement blocks that were flooded and sunk bow-to-stern, creating a long breakwater. Seven floating piers were constructed from which thousands of vehicles, hundreds of thousands of troops and tons of supplies were landed. This artificial port was named Port Winston Harbor in honor of British Prime Minister, Winston Churchill, who conceived of the idea. The port was intended to last only a few months but almost 70 years later large parts of it survive. 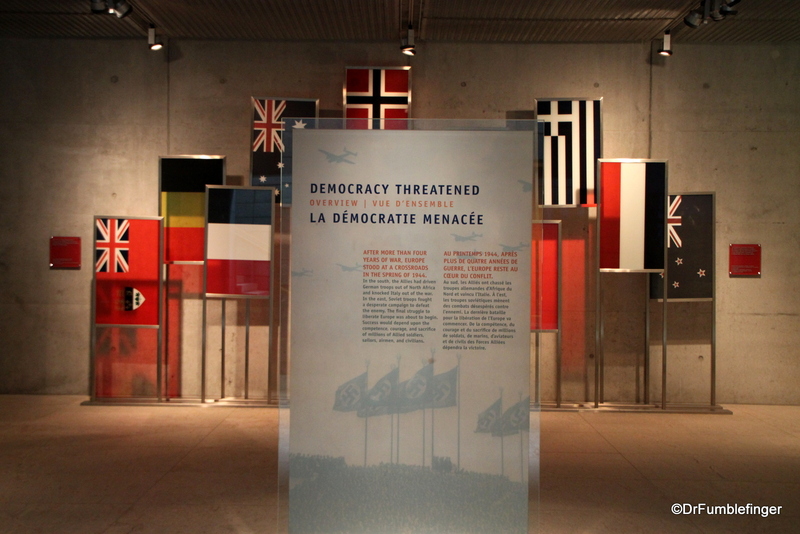 5) Juno Beach, with the Juno Beach Centre in Courseulles-sur-Mer, built by the Canadian government to highlight Canada’s history at the time of WWII. 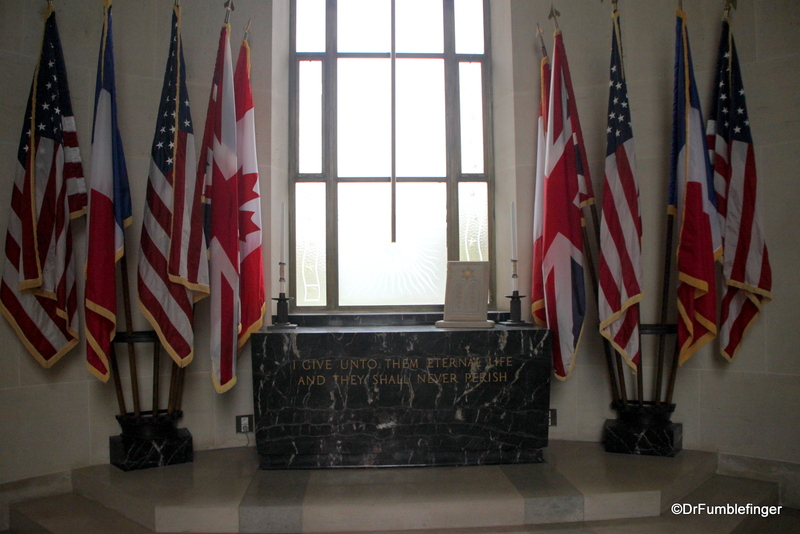 The Centre describes Canadian ties with Britain, the USA and France, and the important role the country played in D-Day (on a proportionate population basis, there were as many Canadian soldiers deployed here as USA soldiers). We ended our visit at the small Canadian Cemetery in nearby Beny-sur-Mer. 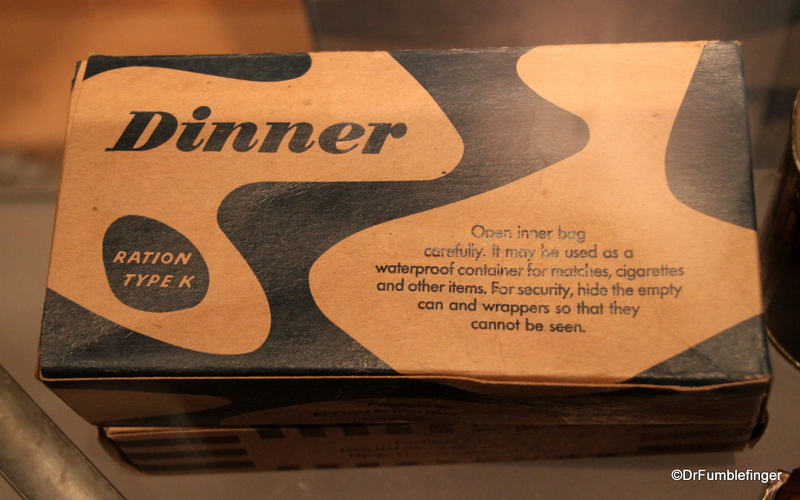 Our D-Day visits were not exciting or fun in any way. 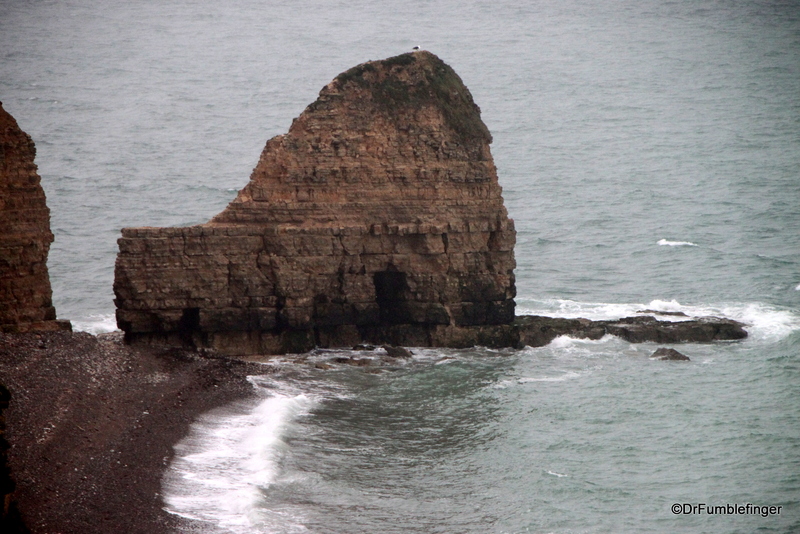 Exploring this historic coast was a sad but moving experience. I could not get past thoughts of the amazing bravery of those stormed these beaches amidst heavy gunfire and fought here, and was deeply saddened to think of all that young life wasted. Have we as a society learned lasting lessons from this? I not sure we have…. 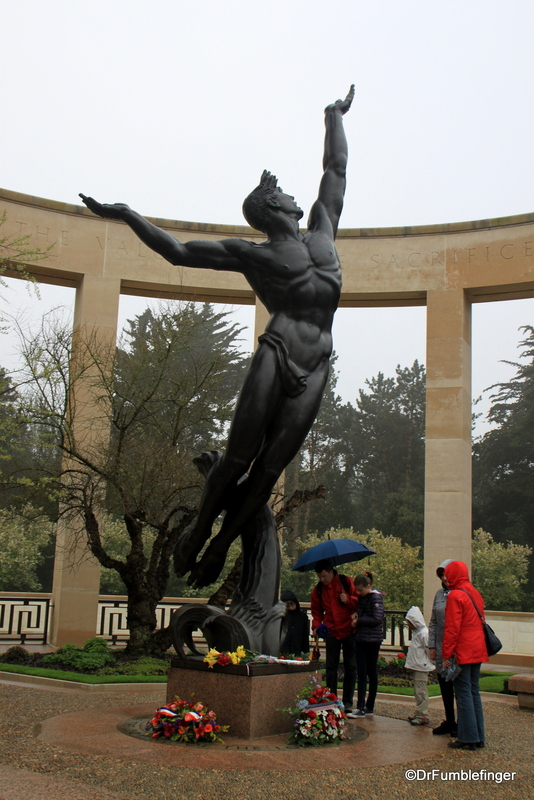 I have to commend the citizens of coastal Normandy, whose relatives also died in large numbers, for remembering with gratitude the sacrifices made by those who liberated them, an unusual attitude in 21st century France. 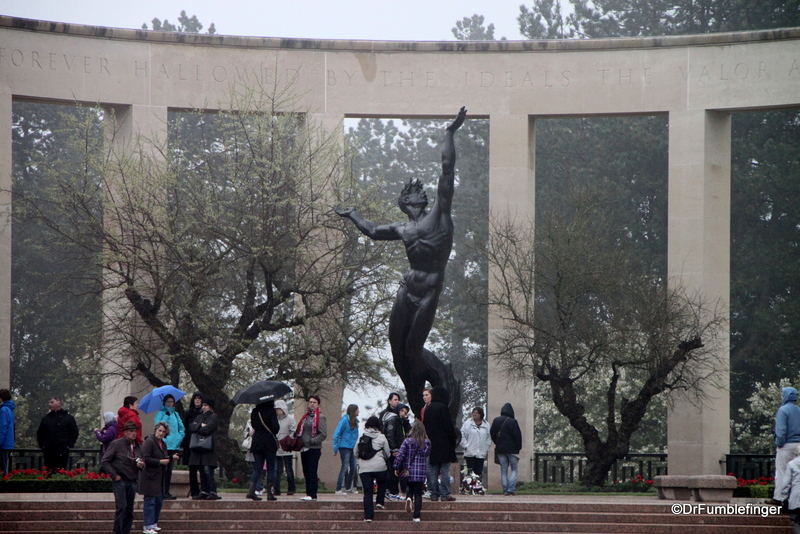 We were surprised by how many local families made a day of going to visit these historic sites; parents teaching the young about the price of freedom. A very comprehensive presentation Karl! Well done. Every time I see these photos I struggle to imagine where the reserves of courage were found by so many young troops and the civilians who were all affected by these massive events. The graves that seem to stretch to the horizons just bring pride and sorry in equal measure – Vod rest their souls.